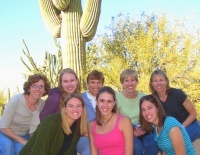 Consider a Phoenix Getaway for Girls Weekends or an Arizona Golf Weekend. Phoenix covers a very large physical area which includes Scottsdale, Mesa and Tempe. My mother, sisters and our daughters had a great girls getaway in Phoenix. When to go: There are more than 300 days of sunshine a year making it a great choice for winter getaways. Summers are hot, so the best time for a visit is Fall through Spring. The area has much to offer including many museums, shopping, top rated resorts and hotels, excellent restaurants and lots of outdoor activities including golf, hiking and more....making it a great choice for an Arizona getaway. Heritage Square - Preserved Victorian houses with museum and shops of art and crafts. Heard Museum - Grand collection of Native American art, pottery, kachina dolls and other historical displays. When we visited the Heard Museum, there was a festival and arts demonstration going on....including native dancing....which was very interesting! Phoenix Museum of History - Unique artifacts, recreation of city's first jail and exhibit on sinking of USS Arizona at Pearl Harbor. Arizona Science Center - Many hands on exhibits and live demonstrations. Steep one mile hike to the top of Camelback Mountain. Phoenix South Mountain Park - Hike and bike over 40 miles of trails with great views. Squaw Peak Recreation Area - Hike to summit for beautiful sunset view of desert. Salt River Recreation - Float down the river on an inner tube. Desert Botanical Garden (located in Papago Park) - Wander the extensive paths and see many rare desert plants, very interesting terrain and gardens. This was one of my favorite places on our Phoenix getaway. There are lots of art galleries in Scottsdale Old Town. For upscale shopping, check out the Scottsdale Fashion Square or the Biltmore Fashion Park. If you are looking for a hotel or resorts for your Phoenix vacation, here are some favorites to check out. JW Marriott Ridge Resort and Spa - Ph. 480-293-5000, beautiful grounds and interior spaces, romantic getaway or pampered girls getaways, scenic views, world class resort and spa. Fiesta Resort - Unique simple, Southwestern style resort with moderate prices. Homestead Studio Suites Hotel Tempe - Ph.480-557-8880, suites with kitchens are great for a Phoenix family vacation. Royal Palms Resort and Spa - Desert landscaping and colors, lush but quaint, great restaurant, good choice for a romantic getaway. Doubletree Phoenix airport - Ph. 602-225-0500, Good choice near airport, atrium, pool, some suites, breakfast included. Ashton House - Ph. 480-990-0682, 1 room suite, feel at home in neighborhood, nearby golf course, swimming room and tennis courts. There many wonderful restaurant choices for a Phoenix getaway. Some favorites include: Coup des Tartes is a quaint, intimate restaurant with great service, perfect for a romantic getaway vacation. The Italian Grotto would be another choice with its reasonably priced Italian food and candle-lit lounge. The fun atmosphere of La Grande Orange Grocery makes it a great casual place for pizza, delicatessen and bakery items. Sawdust on the floor in Bill Johnson's Big Apple add to the atmosphere of this Country Western restaurant....good for beef and barbeque. We had a very fun evening at My Big Fat Greek Restaurant in Mesa. 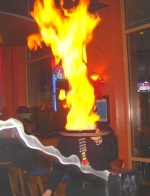 The food was delicious, prices reasonable and the flaming desert spectacular! For Southwestern and new Mexican food check out Richardson's restaurant. Good, spicy food in a crowded informal atmosphere. In Tempe, try the funky Dos Gringos Trailer Park for a laid back atmostphere and cheap prices. Escape the cold of winter and enjoy a Phoenix Getaway!